when it really shows up in the statusbar. I tested it on many web pages fast and slow loading ones. Is there a way to make it a perfect match with the status bar? which might work in conjunction with ClipWait or OnClipboardChange. This seemed to work perfect on some sites, but not all, I noticed that while some sites are still loading the word "Done" appears quickly and then "transferring.." shows ups again and the site goes on loading. Is it possible you make a code that loops when called (So I only need to call it once and it does the looping) and waits for the word "Done" to stick there for 2 or 3 seconds before it confirms that the site is REALLY done loading and then send "Done" to clipboard? 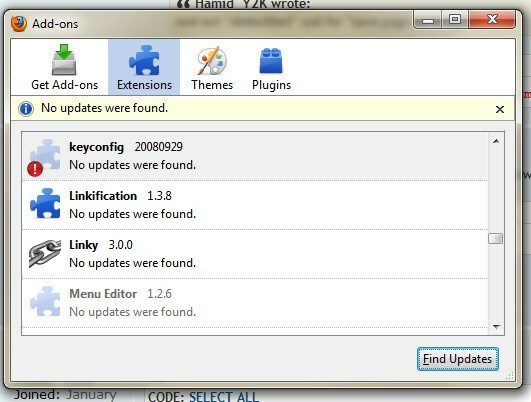 Compatibility information has been updated, it might be necessary to click on Tools > Add-ons > Find Updates (which might incorrectly state at the top that "No updates were found" while "A compatibility update has been applied" as stated below the extension name) if the extensions didn't got re-enabled already. Note that it is possible to disable the compatibility enforcing by adding a boolean 'extensions.checkCompatibility.3.1' through about:config. ballyhairs wrote: This seemed to work perfect on some sites, but not all, I noticed that while some sites are still loading the word "Done" appears quickly and then "transferring.." shows ups again and the site goes on loading. plz give me code for "copy link location" and I used ext CoLt code for "copy link text".? And ext "Abduction!" cod for "save page as image".? Hamid_Y2K wrote: [...] "copy link text".? Hamid_Y2K wrote: And ext "Abduction!" cod for "save page as image".? Can you please give me the updated one? I just want to ask if the compatibility is really updated, because FF 3.6.8 broke my keyconfig (not even compatibility update) when I moved profiles to a new Windows 7 system. I also made the new boolean entry in about:config, but to no avail. what else can i do? It seems Win7 keeps its stuff in places I'm not familiar with. Could that be the reason? I followed Mozilla's guide with the profiles folder and stuff. @grool: I use http://www.mrtech.com/extensions/local_install/ to force compatibility of add-ons like keyconfig and they work fine. You might want to give it a try. grool: the pref name has recently been changed. See http://kb.mozillazine.org/Extensions.checkCompatibility#Background for details. I created a function which hides/unhides tool and tab bars. I use this in situations where I need to save screen real estate to fit multiple windows on screen. The function works perfectly but the situation I mainly need it for is when I have a flash application loaded. The flash application filters the key strokes and I am stuffed because I can't use the function to unhide menu and tab bar. These situations are time critical and I can't afford to lose time, which is why I created the function. Is there anything I can do?